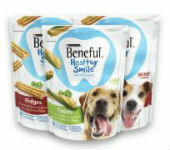 Get a free sample Of Beneful Healthy Smile Twist and Ridges for dogs. Request your sample by filling out the form. Only one sample request per individual or address. Aw, dang.. it’s no longer available.